4 years in 10 minutes won Special mention at Belgrade Documentary and Short Film Festival. 4 years in 10 minutes has won Special mention at ZagrebDox. 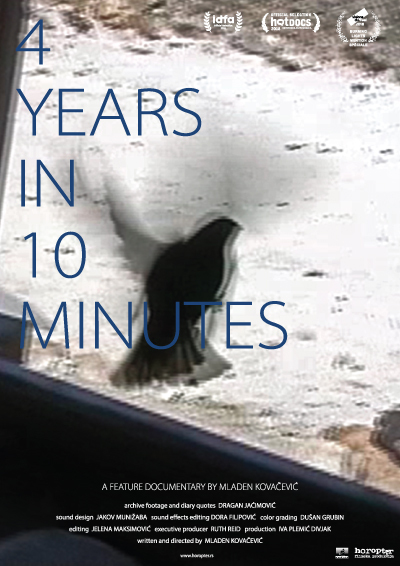 4 years in 10 minutes is selected to Best of fests at IDFA. Screenings are on 15th, 16th, 18th, 20th and 24th November. 4 years in 10 minutes in competition at RIDM - Montreal International Documentary Festival, on 10th and 12th November 2018. 4 years in 10 minutes at Prvi kadar - International East Sarajevo Film Fest, on 15th of November, in Dom omladine Zvornik. 4 years in 10 minutes at Vilnius Documentary Film Festival, on 23rd, 28th and 29th September. 4 years in 10 minutes is opening Pančevo Film Festival, on 05th of September 2018. 4 years in 10 minutes in Competition at Sarajevo Film Festival, at 15h, 12 the of August 2018. 4 years in 10 minutes wins Grand prix at Beldocs. 4 years in 10 minutes domestic Serbian premiere at Beldocs, at DKC, 19h, 11th of May 2018. 4 years in 10 minutes North American premiere at Hot Docs, Canada, on 2nd of May 2018. 4 years in 10 minutes wins Special mention at Visions du reel. Merry Christmas, Yiwu wins Best pitch Vision sud est Award, at Visions du reel, Focus 2018. 4 years in 10 minutes premiers at Visions du reel, Nyon, Switzerland, on 17th of April 2018. Wall of Death and All That won a Special mention at Turin Cinefest, Italy. Wall of Death and All That in competition at UnderhillFest, June 7-15, 2017. Unplagged at 14th Docs Against Gravity, May 12-21, 2017. "Merry Christmas, Yiwu" is selected for Pitching du Réel – Coproduction Forum in Nyon; the film will be presented on 26th of April. "Wall of Death and All That" has won Best Music and Best Sound Award at 64th Belgrade Documentary and Short Film Festival. "Wall of Death and All That" in Competition at Belgrade Documentary and Short Film Festival, Friday 31st of March, at 19h, in Americana hall, Dom Omladine. "Wall of Death and All That" will be screened at Millenium Documentary Film Festival in Brussels on Sunday 26th of March at 19h, at Cinéma Galeries. "Wall of Death, and All That" is in competition at ZagrebDox. First screening is on Monday 27th of February 2017, at 21h, Theatre 2; additional screenings on 2nd March, 12am, Theatre 4, and 3rd March, 22h, Theatre 5. "Wall of Death, and All That" will screen at BANEFF, Stockholm, on 22nd December, at 17:30. "Wall of Death, and All That" opens Documentary Film Festival DOKUMENT , on 2nd of December, in Vranje. "Wall of Death, and All That" at DOKUDOC, on 9th of September, at 22h, Sodni Stolp, Maribor. "Wall of Death, and All That" in Lighthouses competition section at PAFF. Screening is on 8th of September at 22h, at Kulturni Centar Pančevo. "Wall of Death, and All That" is in competition at MakeDox festival, in Skopje. The screening is on 24th of August (Wednesday), at 23h, at Kurshumli An. "Wall of Death, and All That" will have a regional premiere in competition at Sarajevo Film Festival, on 14th August, at at 15h, in Multiplex Cinema City - Hall 1. "Wall of Death, and All That" at Cinema City, on the opening night, 25th June, at 21h, SKCNS Fabrika Open Air; and 27 June, 21h, Firchie Think Tank Studio. "Wall of Death, and All That" has Won Best Film and Best Camera at Beldocs 2016. "Wall of Death, and All That" is in competition at Beldocs. The screening is on 14th of May, at 21h, at DKC. "Wall of Death, and All That" has been selected in the International Competition at Visions du Réel. "Unplugged" Won Public (Audience) Award at Festival Internacional de Cine Rural de Chivilcoy, Argentina. "Unplugged" at Full of Noises, UK, in Cookes Studios, Barrow, on 1st August 2015. "Unplugged" at L'Europe autour de l'Europe, on 1st april 2015, at 19:30, at Centre culturel de Serbie. "Unplugged" in Official selection of of ETHNOCINECA, Vienna, on 7th May 2015, at votiv3. "Unplugged" in Official selection of of Ethnografilm, Paris, France on 11th March at 21h, Ciné 13 Théâtre. "Unplugged" in Competition at Big Sky Documentary Film Festival, Montana, US; on 11th of February at 21:00, at Crystal. "Unplugged" in Competition at Cinequest, San Jose, CA. The screenings are on 25th February at 16:45 at C12, 4th March at 17:00, at C12, and 7h March at 12:00 (noon) at C12. "Unplugged" at Norient Musikfilm Festival, in Bern, from 15th to 18th January 2015. "Unplugged" at F.A.M.E. La Gaîté lyrique, Paris, on January 14th. "Unplugged" has Won the Long Film Commendation Award, at International Folk Film Festival, Nepal. "Unplugged" at Festival Internacional de Cine De Gualeguaychu, from 2nd to 10th December. "Unplugged" is invited to Balkan Florence Express 17th to 20th November 2014. "Unplugged" at Porecdox, on 8th November, at 19:00, Kino dvorana POUP. "Unplugged" has won the Award for Best Documentary Feature and the Award for Best Director at AcampaDoc, Panama. "Unplugged" is honored to be invited to DOK Leipzig, to Special Program reflecting History of Yugoslavian Documentary. The screeneings are on 30th of October and on the 1st of November. "Unplugged" in International Competition at Ecologico International Film Festival, Italy, 11th to 14th December. "Unplugged" will be screened at BIFED, Bozcaada International Festival of Ecological Documentary, Turkey, 30th October to 02nd November. "Unplugged" in Official selection of Orlando Film Festival, on 25th October, at 11:15am, Theatre 8, The Cobb Plaza Cinema. "Unplugged" is invited to Life Sciences Film Festival, Check Republic, Prague, from 13th to 17th October. "Unplugged" in Competition at Cine Eco, Festival International De Cinema Ambiental, Portugal. The screening is on Friday 17h October, at 14:30 in Cineteatro. "Unplugged" in Competition at AcampaDOC, Panama. "Unplugged" is invited to Open the Szczecin European Film Festival in Poland, on 30th September. 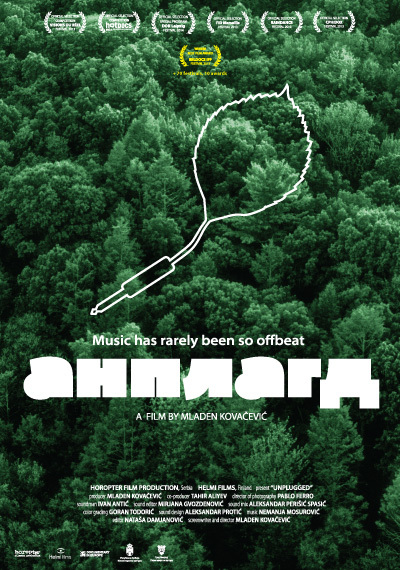 "Unplugged" will be screened in Official selection of Jahorina Film Festival, on 3rd of October 2014, in Hotel Damis Pale. "Unplugged" has Won Jury Award for Best Film at KFJ Festival. "Unplugged" in Competition at Ex Ponto Festival, Slovenia. The screening is on 17th Septmber at 17h, in JSKD. "Unplugged" in Competition at Tuzla Film Festival. The screening is on 11th of September at 15h, in Narodno Pozoriste. "Unplugged" in Competition at KFJ Film Festival. 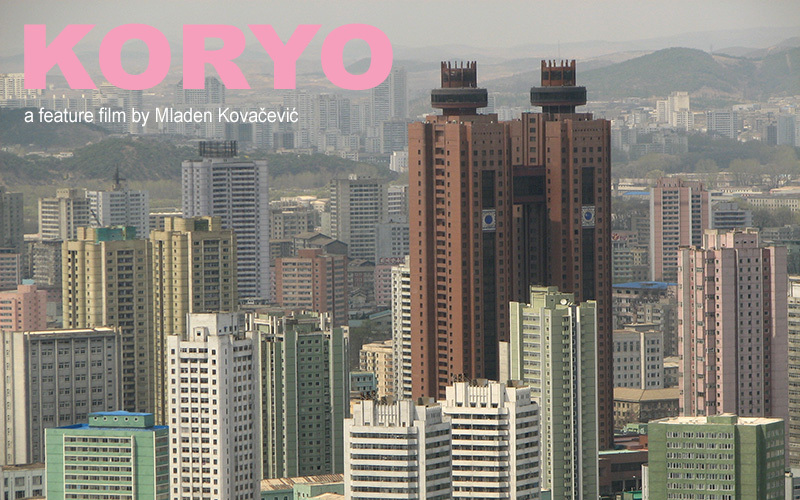 The screening is on 6th of September at 20h, at Kino Kocevje. "Unplugged" has Won Best Cinematography Award at at Starigrad Paklenica Film Festival. "Unplugged" in Competition at Starigrad Paklenica Film Festival. The screening is on 04th of August at 21:30, at Theatre Velika Paklenica. "Unplugged" in Official selection of Syros International Film Festival, Greece. Screening is on 27th of July at 00:00, at Pinakothiki. "Unplugged" in Official selection of International Film Festival of Patmos, Greece. Screening is on 26th of July at 23:10, at Skala. "Unplugged" will be screened at Viljandi Folk Music Festival, Estonia, on Friday 25th of July 2014, at 12:00h, at Sakala Center. "Unplugged" will be screened in Official selection of Supetar Super Film Festival, Croatia, 17h of July 2014, at 23:00h. "Unplugged" Won Special Mention at MakeDOX. "Unplugged" is selected to Mediterranean film festival Split. The screenings is on 10th of June, at 18:00, at Kinoteka Zlatna vrata. "Unplugged" in Competition at MakeDOX. The screenings are on 18th of June at 23:00, at Kurshumli An, Skopje, and 19th of June at 12:00, at MKC. "Unplugged" in Competition at Brooklyn Film Festival. It is the New York premiere. 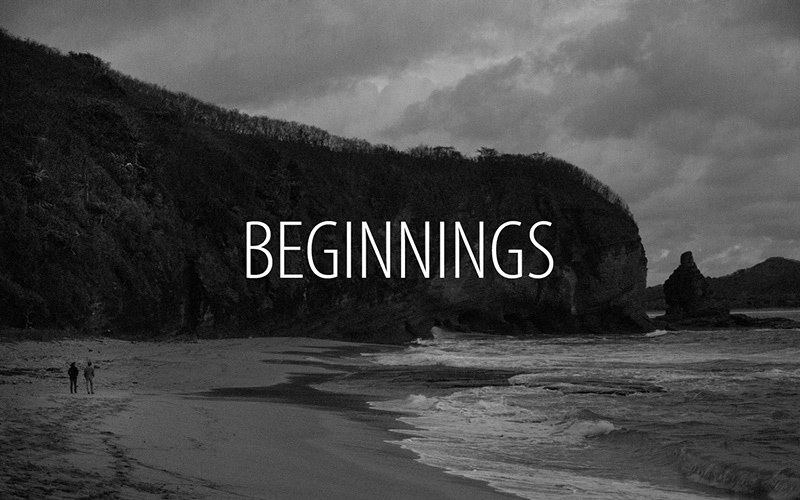 There are two screenings: on 31st of May at 14:30, at Windmill Studios, and 05th of June at 18:30, at indieScreen. "Unplugged" in Competition at Hoboken International Film Festival. The screening is on 4th of June at 16:00, at Paramount Theater, Middletown, NY. "Unplugged" is selected to DOK.fest Munich. The screenings are on Friday 9th of May, at 17:00, at Filmmuseum; Saturday 10th of May, at 16:30, at Gasteig: and Tuesday 13th of May, 19:30 at Rio 2. "Unplugged" will be screened in Official selection of Arizona International Film Festival, 14th of April 2014, at 20:00h, The Screening Room, 127 East Congress, Downtown Tucson. "Unplugged" will be screened in Official selection of Madeira Film Festival, Portugal, on 25th of April 2014, at 18:30h, Municipal Theatre in Funchal. "Unplugged" in Official selection of Millenium International Festival, Brussels. Screening is on 31st of March, at 18:30h, at CIVA. on 28th of March at 21:00, "Pasaka", The small hall, and on 03th of March, at 16:30,"Forum Cinemas Vingis", Hall 11. "Unplugged" in Competition at Jaipur International Film Festival, an Indian premiere. Screening on 4th February at 17:00h, at Golcha Cinema, Screen-2 (Tivoli). "Unplugged" in Official Selection of Trieste Film Festival. Screening is on Saturday, 18th January, at 22:00h. "Unplugged" in Official Selection of Leeds Film Festival. Tuesday 19th November at 20:00, and Wednesday 20th November at 17:00, both screenings at Leeds Town Hall - Albert Room. "Unplugged" in Official Selection of CPH:DOX. The screenings are on 11th November at 17:00, at Vester Vov Vov cinema, and on 14th November at 17:45 at Gloria cinema. "Unplugged" is selected to Competition Program at Minsk International Film Festival "Listapad". The screening is on 7th of November, at 16h, at Cinema theatre "Mir". "Unplugged" at EBS International Documentary Festival, in Seul, South Korea. The screenings are on 22nd October at 11:00 and 25th October 13:10, at KU Cinema Trap. "Unplugged" is invited to Ânûû-rû Âboro festival at New Caledonia. The screenings are on 20th October at 18:30pm, at Tribu de Näpwëtëmwä (Tibarama); on 23rd October at 11:00pm, at Médiathèque; on 24th October at 19:00pm, at Commune de Hyehen (Hienghène). "Unplugged" is invited to Raindance Official Selection. It is a UK premiere. The screening is on Sunday 6th October at 2.30 pm, Piccadilly (Apollo) Screen 3. "Unplugged" is selected to Competition Program at LET'S CEE. The screening is on Friday the 20th of September, at 6pm, Actor's studio Vienna. "Unplugged" is invited to Balkan Dox Competition Program at DOKUFEST. The screening is on 23rd August, 16:00, at Shtëpia e Kultures. "Unplugged" is invited to Competition Program at Sarajevo film Festival. The screening is on Tuesday 20th August, Cinema City Hall 1, at 20:30. "Unplugged" is invited to FIDMarseille. The screenings are on 4th July, at 22h, at Cinema Varietes, and 7th July, at 18:30h, at National Theatre La Criée. "The Wall of Death, and All That" won the government funding at the Film Center Serbia (Serbian Ministry of Culture) open call. "Unplugged" has won The Best Film award at BELDOCS IDFF. "Unplugged" will be screened on BELDOCS (in Serbian competition selection), on 27th April, at 20h, at DKC (Domestic premiere); 27th April, at 21h, at DKSG; on 28th April, at 19h, at cinema Fontana. "Unplugged" has been invited to Hot Docs, Toronto (International Competition selection), its North American premiere. The screening schedule: 27th April, at 21:15h, at TIFF Bell Lightbox 4; 29th April, at 13:30h, at TIFF Bell Lightbox 3; 5th May, at 20:30h, at TIFF Bell Lightbox 4. "Unplugged" is to be screened in Nyon, on the 20th of April, at 22h, at Capitole1. Second screening is on 21st, at 12h, at Capitole 2. The World Premiere of "Unplugged" will be at Vissions du Réel, Nyon, where "Unplugged" has been selected to International Competition.